Have you been looking for a perfect place to spend your vacation? Get ready, Surf Shack Iztapa is here to make your dreams come true! Surf Shack Iztapa is a hostel located in the small town of Iztapa, Guatemala. It's one of the best-kept waves in Guatemala where you can experience local life and empty lineups. Get yourself involved in this surf camp, go on some exciting surfing sessions, and stay in a peaceful accommodation. The Hostel Surf Shack is a familiar project that came from the necessity of hosting surfers and travelers who come to Iztapa looking for perfect waves. The Hostel is in nature, in front of the river. It eases to go to Iztapa Center in a five-minute walking and to go to the beach crossing through the river (by boat, kayak or stand-up paddle). The Hostel offers five rooms and cabanas, the option of single, double or triple, with private or shared bathroom, kitchen, pier and a shack at the beachside. The clean simple rooms are the three rooms with one double bed and one single bed, one room with two single beds, and one room with three single beds. This surf camp is situated in the beautiful town of Iztapa, right in the mangroves which are 300 meters away from the beach. Iztapa is a village known mainly because of its black dark sand, rivers, fishing and surfing spots. It is a village with good and friendly people. 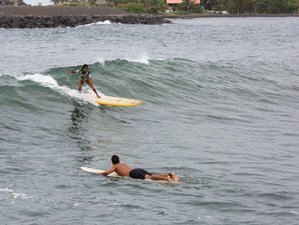 There are two different surf spots in Iztapa. The first one is the break at the sea in front of the river mouth and runs to the beach. It is a strong, fast and long right, with two barrels sections. This wave can hold big swells over ten feet for the experienced surfers. The second one is a river wave, generally to leave that changes according to the tide. There is also another right one. It is a fatter wave which is ideal for the beginners or not so for the experienced surfers. The food is not included in this surf camp. However, Surf Shack Iztapa has an open equipped kitchen. By chicken bus, first get to Escuintla. From the bus terminal, take the bus to Puerto San José. Then, stop at the cross that goes to Iztapa and take another bus to the Iztapa Center. Then, stop at the super 24 store. You can also take the bus from El Paredón. From El Paredón, take the only bus that runs from 6 a.m. to Puerto San José. In Puerto San José, take another bus to Iztapa, then stop at the super 24 store. From Monterrico, you can also take the bus to Puerto Viejo. Then, take another bus to Iztapa and stop next to the super 24 store. From the super 24 store (super 24 is located at the Principal Street and 3rd Street cross), walk through 3rd Street (calle 3) on the river direction until the end of the street. The hostel is the last house by the river, in the right side with a wooden gate, lote 50. Surf Shack Iztapa is a low budget hostel situated in Iztapa offering surf camp. The main company goal is to attract tourists / surfers to Guatemala without being expensive.